I have a deep desire to preserve love in it's deliriously happy season of life- the first day of your life-long marriage. I get a rush from thinking that, long after the confetti has been swept up, a little part of me will be there in your story. You may not remember my name on your silver anniversary, but you'll use my perspective from your wedding day to recall your vows. When your grandchildren see that image of a tear rolling down your dad's cheek, it'll be because I saw it and kept it for them. Your wedding will be a great day, but it won't be the best day ever. Believe it or not, God willing, you are going to love your fiance more in five years than you do right now. And then more and more until your last breath. That is what weddings are really about. They are a leap of faith that you will grow together with someone based on a trust that can't be put into words. They defy logic and represent hope in its purest form. Even though weddings are common, they are extraordinary. And that is why I photograph weddings; because I believe marriage matters. "I knew I had nothing to worry about when it came to our wedding photos." "You are truly talented in what you do. You calmed our nerves both on the big day and throughout our engagement. " "Thank you for being our photographer. Your work is so wonderful. I knew from the moment I saw that first post on Instagram. I was like yesssssss, she has to take us! " You want your photographs to look beautiful, but, above all, capture the real emotion of the day. You are giddy about your dress and can't wait for your groom to see you all dolled up. You might exchange love letters while getting ready, write your own vows, or include a family heirloom in the wedding. You will laugh when you spy your photographer dancing as she shoots the reception. You are a little nervous, but mostly excited about becoming husband and wife. Your vows won’t be magic, they’ll be better. They’ll be real-life promises to love each other, even on days you don’t like each other. They’ll be promises to share your whole life and whole person with your spouse. They’ll mark the beginning of a joint adventure, a shared vocation. And you still have a hard time believing the man of your dreams wants to spend the rest of his life with you. Leading up to the wedding, I help you plan the photography aspects of the day hand-in-hand, so that we have the best opportunities for photographs and the fewest opportunities for stress. From our bridal guide to album design, you'll be guided every step of the way. During your engagement session, we will somehow develop this magical shorthand where you’ll know exactly what I’m thinking and be able to hit that pose like a pro. (I don’t know how it happens consistently, but it does!) You will both actually enjoy your photography and be confident that your images will capture the true essence of your relationship. First things first! Hop on over to the contact section and send me a note! Tell me your names, date, venue, and a little about your love story! Feel free to ask lots of questions; I'm here to help! If I have your date available, we’ll meet (either in person or telephonically) to see if we’re a good fit. We’ll go through all the different collections together, so you won’t have any unanswered questions. Once your contract is signed and the deposit is paid, you'll officially be on my calendar! After booking, CWP Couples receive a 70+ page bridal guide specifically created to help you get the most out of your wedding photography. It includes wedding advice for each season, ideal timelines for your day, family formal portrait planners, and so much more! I LOVE engagement sessions. Engagement Sessions have the handy benefit of getting you comfortable in front of the camera in preparation for the big day! I'll teach you everything you need to know, and make you feel totally relaxed; promise! You're only job is to love on each other! Once we get closer to your wedding date, you will receive a timeline and portrait planner to make sure we get all those dreamy images you've been dreaming about! The planner will make things easy peasy so you don't have to overthink your family formals or timeline! All along the way, I'm here to help! From timelines to vendor recommendations, you should always feel free to shoot me an email! About two weeks before the big day, we'll have one last chat to go over any lingering questions and our timeline. That way, the morning of your wedding, all you have to think about is getting married! step 7: your wedding day! Once the big day arrives, it's time to relax and enjoy your day! From the little details, to the ceremony, to bride and groom portrait time (my favorite! ), to the reception- you can trust that I will be working hard to capture the beauty and the genuine emotion of the day! When you see your featured post on the CWP blog, you'll be reminded of all that joy and see all the love and laughter from a whole new perspective. Galleries are delivered on a beautiful shareable website that allow you to download and order images directly from the gallery. Easy breezy! Gone are the days of having to burn extra copies of DVDs or uploading a million images to some kiosk! I recommend having a little date night when your gallery is unveiled! Pour some wine and relive the day! Should you choose to include an album in your wedding package, you can use your gallery's favorites function to easily share which images you definitely want included in your album. I personally design each page and work with an incredible company out of Kentucky who prints and hand assembles each album with archival materials that are guaranteed for life. 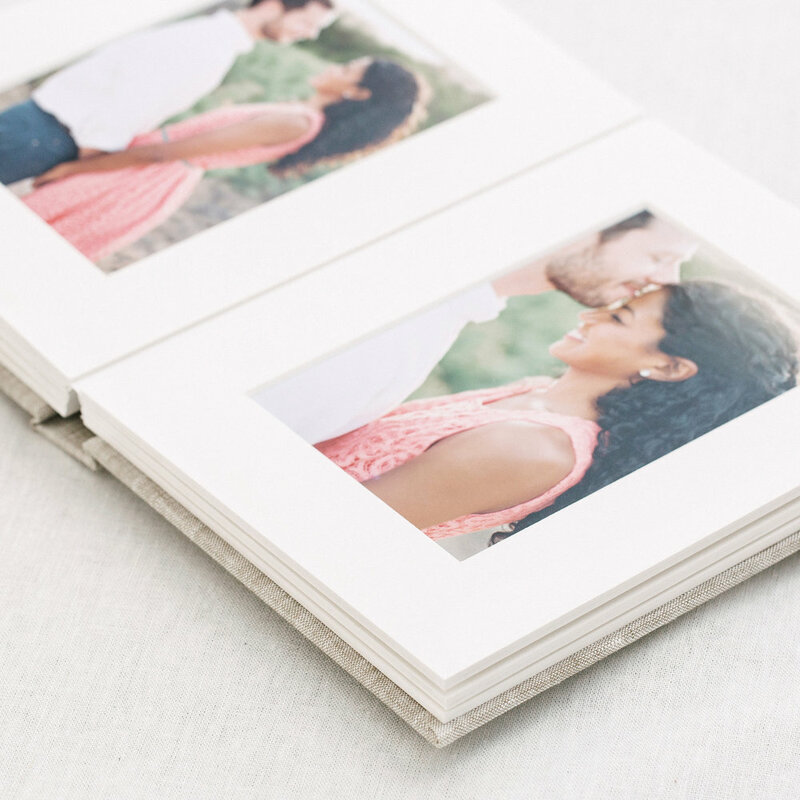 Our flushmount albums are custom designed, handcrafted, and made to stand the test of time. Leather, linen, or silk covers paired with thick, lay-flat pages elevate wedding images into enduring fine art that tells a story for generations. Photographers use the word "investment" because we have seen time and time again how our images become more precious as time marches on. Your story is worthy of being told. And you should find a storyteller who gets it and can tell future generations what this day was truly about. And along the way, this whole photography experience should be FUN and EASY. Because when you're relaxed and can trust your photographer, that's when your photos will come alive. I don't book every couple that inquires because I want to make sure I'm the right fit. When you click "Let's Chat" below, you'll get more than just a detailed price sheet. You'll get an in-depth look to how I photograph weddings. Wedding Packages start at $1,500. The next step is to tell me a little bit about yourselves! I'd love to hear more about you, what you're about, what makes you tick, your story. Fill out the contact form and I'll be in touch within 24 hours. Can't wait to hear from you! Scroll through our brides and grooms' frequently asked questions. If you still have questions, drop me a line! My style is interactive during portraits and discreet during quiet, emotional moments. There are parts of each wedding day when I need to take control to accomplish everything on schedule as well as moments when you shouldn’t even know that I’m there! Should we come up with a list or Pinterest board of specific pictures that we want? Yes and no. You will receive and complete a portrait planner so I know with whom you want to have a formal portrait made. And if there's some particular shot you really have your heart set on, please do tell me! In these cases, it's best to have a game plan to get those important images. However, I typically advise against specific shot lists. CWP is known for capturing your day as it unfolds in an authentic, joyful way. We can't accomplish those hallmarks if we are focused on a long list. I shoot with a Canon Mark III and 6D with an arsenal of lenses that I choose for specific purposes. I bring the light (flash, softboxes, other diffusers) for receptions and for venues that are dimly lit and have back-ups on hand just in case! Sometimes I even shoot with two cameras at once! But remember, all of these items are just tools and only as useful as the photographer holding them! Will you work with our wedding planner? Sure thing! I’m happy to work with a planner or coordinator on timelines and vendor coordination! I do require contractual issues to be dealt with directly, but have witnessed first hand how a good coordinator can really add to the enjoyment of your day! P.S. If you need a recommendation, I’m happy to pass along some planners' names! How much does CWP charge for weddings? CWP Wedding Packages begin at $1,300. Further pricing is dependent upon what options a couple chooses (coverage hours, second photographers, albums, travel needs, etc.). Fill out the inquiry form for more information and you'll hear back within 24 hours. Sure thing. If there's a combination of services and products you'd like to book but don't see listed in the proposal, just shoot me an email and we'll tailor a package to your individual needs. How much does an engagement session cost? Our most popular collections include an engagement session because it really helps us get to know each other and get you used to the camera before the big day. Al la carte, engagement sessions are $500. Once we have had a chance to chat a bit and have confirmed I have your date available, I'll send over a proposal that will walk you through all our CWP package options. As you peruse the guide, please reach out and ask all the questions you'd like! If you decide I'm the one, you can save your date by signing your contract and paying your deposit online. How many hours should we book? The typical wedding that takes place in one venue (or two venues that are close together) can usually be photographed with 8 hours of coverage. But the bridal guide will help you consider what type of coverage you want, how much cushion time you need, and time for travel between locations. CWP knows that timelines aren't usually set in stone when your photographer is booked, so you will have the option to book additional coverage as we get closer to your big day. When deciding how to structure your wedding day and how much coverage you should book, think less about the sheer quantity of images and more about what events of the day you want covered and at what pace. For example, 8 hours coverage time is often the sweet spot for most weddings, but some couples just really want things to be relaxed, have plenty of time for portraits, and have lots of cushion time built into their schedule, so they opt for more coverage. Other couples are comfortable with foregoing reception coverage in order to book smaller packages but keep the pace of their wedding day enjoyable. Either way, we don't want to over schedule. Don't sacrifice the moments by rushing through this once-in-a-lifetime event. A non-refundable deposit of 25% of the total package is due to secure any wedding date. The remaining 75% is due 8 weeks prior to the wedding date. You'll receive email reminders to help keep us on track. Do you always work with a second photographer for weddings? I always prefer to at least have an assistant with me at weddings, but unless a couple chooses a package with an additional photographer, I can't promise a second shooter. When the package does include a second, I choose one from a small group of trusted regional photographers who know weddings inside and out, just like me. How do we add a secondary photographer? Adding another photographer to your package will allow us to capture more detail shots, more candid shots, and various angles. You can select the add-on during your proposal and a second photographer will automatically be added to your contract. If you have already signed your contract but would like to add one on, just shoot me an email. I'll make sure I can line up one of my favorite second photographers before we make an addendum to your contract. How can you capture the bride's procession AND the groom’s reaction without having a secondary photographer? Magic. Just kidding. It's definitely more smooth when there are two photographers, but so long as I have aisle access, I can get both the groom's reaction, and the bride walking down the aisle with my two-camera set up. Even if we don't have a second photographer, can you still capture everything we need? You bet. I have a lot of experience shooting weddings and can operate solo without worry. A second shooter gives us more options and angles, but it's by no means a pre-requisite to telling the story of the day. If you want to talk more about whether you should invest in adding a second photographer to the CWP team, just shoot me an email or text and we can talk through it. Will you travel for our wedding or engagement session? Absolutely! I love shooting in new places any chance I get! 50 miles of complimentary travel (round trip) come with each engagement session and wedding. Additional travel is billed at 90 cents per mile. That takes care of meals, tolls, gas, my time- all that jazz. Depending on your coverage time and distance, a hotel stay may also be required. For weddings or engagements that require air travel, we work up a quote tailored to that event's particular needs. Can we travel from location to location during our wedding day? Yup! There is no fee for travel between locations, but coverage is continuous so a long journey after we begin shooting cuts into our photography time as well as time with your guests. If you need a second set of eyes to look at the map and envision the day, I'm happy to help you with your timeline. 50 miles of complimentary travel (round trip) comes with each engagement session or wedding. Additional travel is billed at 90 cents per mile. That takes care of meals, tolls, gas, my time- all that jazz. Depending on your coverage time and distance, a hotel stay may also be required. For weddings or engagements that require air travel, we work up a quote tailored to that event's particular needs. What if it rains during our wedding? During our engagement session? Don't worry, we've got this! I have been shooting weddings for years, and I feel confident in any weather condition. If the forecast is confidently calling for rain during your engagement session, we will just reschedule the session. It's a lot easier to reschedule an engagement session than a wedding! If it's a local shoot and the forecast is iffy, we may wait until that day to decide. If we are planning to travel, we'll likely call it 48 hours before the session. What happens if you get sick!? While I'm not afraid of shooting a wedding while under the weather, if I were to get really really sick or have some sort of emergency- here’s the back-up plan: Optimally, we would have a second shooter ready to step-up to the plate as the primary photographer and you would receive a portion of your fee back. I only use photographers I myself would book, so I feel totally confident that they’d be able to take over in case of an emergency. If we didn't have a second photographer booked, you would recieve a full refund and I would call on the network of photographers I work with to try and find you a replacement. At that point, you would quickly book the other photographer. I must stress that I have never once had this happen. You can be assured that I take this responsibility very seriously. How long does an engagement session last? I usually aim for 45 minutes to an hour, but I get so wrapped up in the shoot that I always go over! Bottom line, if you have reservations for dinner after the shoot, let me know so I'll set an alarm! When should we start wedding day coverage? Your bridal guide will give you more details on this process, but generally, I recommend scheduling my start time 3 to 4 hours before the ceremony to cover all the little details, bridal party preparations, the wedding party portraits, venue and ceremony location, etc. The time before the ceremony is typically when the prettiest pictures from the day are captured! What time of day should I schedule my engagement session or bride and groom portraits? Photographers get all giddy about "Golden Hour." It's when the sun is low in the sky and the light is super soft and flattering. We usually get two a day if the weather is cooperating and it begins about 90 minutes before sunset or right as the sun rises. When scheduling portraits, photographers take into account the location and season, whether there are mountains or buildings blocking the sun, etc. etc. The bridal guide goes over ideal portrait times with more detail, so be sure to check that section out too. But the short answer is, "let your photographer choose the time for these portraits." You'll be glad you did! Can I add on more time to my wedding day’s timeline if I need to? Yup! I totally get that schedules need to be flexible during the planning process and you usually don't have things nailed down when you book a photographer. So just shoot me an email at least two months before the big day and we'll make that adjustment to your contract and update your invoice. If you need to add on time the day of your wedding we can work that out too. I work closely with couples to set reasonable timelines, that way we have the fewest opportunities for stress the day of and we are able to get the most out of your coverage time, but sometimes things happen! If your dress breaks and needs a quick sew job or the entire groom’s party gets stuck in an elevator for 40 minutes (I’ve seen both), then we will re-juggle the timeline the best we can and, if necessary, add on some additional coverage, to make sure we get those must-have shots. What is a First Look, exactly? A first look is a more private meeting of the bride and groom just before the ceremony. It allows for more intimate photos and some breathing time with your (almost!) spouse! It’s just the two of you getting to enjoy the moment without the distraction of guests, music, or ceremony (and me at a comfortable distance capturing some really genuine moments.) Some couples really want to keep the tradition of waiting until the aisle to see each other on their wedding day, while others love the idea of having some calm time to step away from the hustle and bustle and just be together. First looks also have the benefit of giving you more of those romantic bride and groom portraits. Plus, since you can do all your bridal party pictures pre-ceremony, a first look gets you to your party sooner! How much time do after-ceremony photos take? Will you eat at the wedding? Yes, please! Everyone on the CWP team will need to eat, but we'll try to do it quickly so we don't miss anything! If you see us jump line and grab our plates before everyone else, it’s not because we were raised in a barn, it’s just so we don’t miss any important shots. The DJ is usually really great about giving us a head's up before he or she starts the toasts, so the only photos missed are of your Uncle Sal eating green beans. Oh man! I've never had someone complain that they didn't get enough pictures! While I work hard to cull (delete) test shots, duplicates, eye blinks, etc., I have such a hard time picking my favorite shots, I typically over deliver! Honestly, I need to get better at this, as I truly believe a well-curated gallery is more valuable than a huge, unruly one! My typical wedding ends up with about 60 images per hour: more than one photo per minute! But each wedding is different, and the quality and amount of images will depend on things like travel time during the coverage (between venues), what details are available, whether the weather or venue necessitates setting up flash and lighting modifiers, activities and cooperation of bridal parties and guest, - stuff like that. When deciding how to structure your wedding day and how much coverage you should book, think less about the sheer quantity of images and more about what events of the day you want covered and at what pace. For example, 8 hours coverage time is often the sweet spot for most weddings, but some couples just really want things to be relaxed, have plenty of time for portraits, and have lots of cushion time built into their schedule, so they opt for more coverage. Other couples are comfortable with foregoing reception coverage in order to book smaller packages but keep the pace of their wedding day enjoyable. Can I get all the images from my wedding or shoot? No, but trust me, you do not want them all! A huge part of the overall experience is culling. That means I take the time to sort through all the images and pick the best pictures that tell the story of your day. It would be completely overwhelming to see all the test shots, duplicates, eye blinks, etc. One of the reasons “shoot and burn” photographers are so cheap is because they skip this step, just giving you every unedited, unculled photograph. If you’re investing in a real photographer, you shouldn’t have to sort through all of the images that should have been left on the cutting room floor. No, but for good reason! I promise! I wrote a whole blog post on the topic here: https://www.clairewatsonphoto.com/claire-watson-photography-blog/2016/08/11/what-is-a-raw-photo-and-why-are-togs-all-touchy-about-them? When will my gallery be delivered? Wedding Galleries are delivered within 9 weeks. How do I order prints of my images? I love delivering images digitally because our digital galleries make clients' lives so much easier! You can order prints, canvases, and other products from my professional lab directly through your gallery! You just click on the image, add the product and size you want to your cart, checkout, and voila! In about two weeks your professionally calibrated and printed photos will be delivered straight to your door! No need to download, upload, or resize! Plus, you don't have to play middleman taking orders from family members or friends. You can just give them the link! Can I only order prints from my gallery through CWP or can I download my images and print them where I please? Your images are yours to have and to hold, and that includes digitals. All of our collections include sharing galleries and our most popular collections include a printing release too. I want you to print your images on archival paper with correct color profiles, so I really encourage printing with our lab. I want these images to serve as tangible reminders of the relationships that bind us together and want your prints to last as long as possible. How should we credit you as our photographer on social media? How do we get our wedding published? Great question! I love seeing our couples in print and on blogs, so it's always fun to work on this goal together! First, be sure to fill out your ‘Wedding Vendor Questionnaire’ completely. Magazines and blogs want lots of information about the vendors. So it's best to compile all this information before things get too hectic or too close to submission deadlines. Second, be sure to book adequate coverage with some cushion room in your timeline. Magazines and blogs love detail images and those are the first things to get scrapped if a timeline is running behind. Third, consider a collection with a second photographer. A second photographer allows us adequate time to get the safe shots and move on to more interesting storytelling with creative approaches and angles.